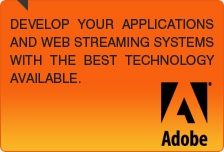 The best hosting solutions for coldfusion and streaming services on Adobe Media Server 5. The experience gained since 1999 on Adobe (Macromedia) through the provision of hosting services, to training and certification for the design and development of Web applications (RIA), IdeaWeb.IT make a unique and ideal partner for your requirements. For this reason IdeaWeb.IT is actually : "Web Ideas and streaming solutions". Try our free hosting plans and check the functionality of our streaming server. You can then purchase a hosting plan from 9 € / month with guaranteed bandwidth.